The production at Portland Stage through Sept. 9 is a collaboration with Maine State Music Theatre. Think you can’t put away your troubles for a couple of hours and lose yourself in a musical comedy about a bunch of nuns? Nonsense! 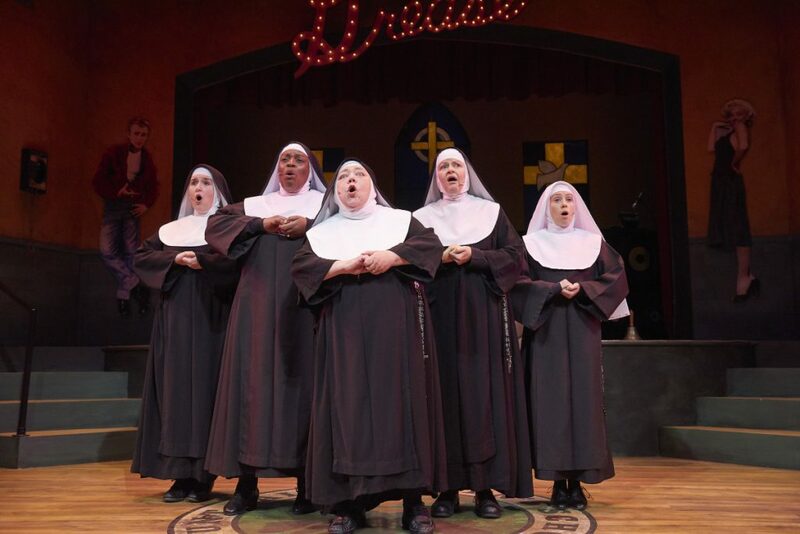 The hilarious off-Broadway hit “Nunsense” by Dan Goggin is being co-presented by Portland Stage and Maine State Music Theatre, and you can see it at Portland Stage through Sept. 9. A Saturday matinée performance revealed a fabulous ensemble cast and equally terrific three-piece live band. The show included several moments of audience involvement, some planned and some off the cuff. WHEN: Through Sept. 9, with performances at 7:30 p.m. Tuesday, 2 and 7:30 p.m. Wednesday, 7:30 p.m. Thursday and Friday, 4 and 8 p.m. Saturday and 2 p.m. Sunday. TICKETS & INFO: $55 to $75; portlandstage.org or (207) 774-0465. “Nunsense” is set in a high school gymnasium that is set up for performances of “Grease” and also is where rehearsals are taking place for a fundraising talent show. The story begins in the aftermath of the accidental death of 52 nuns of the Little Sisters of Hoboken. Sister Julia, Child of God, served up a bad batch of vichyssoise, and the 19 surviving sisters were left to handle the burials. A successful greeting card business was launched to cover burial costs. However, Sister Mary Regina, aka Mother Superior, made a budget miscalculation when she decided to purchase a high-end TV, resulting in a shortfall. This meant four of the deceased nuns ended up in a freezer awaiting their final resting place. While this all may sound rather macabre, it’s anything but that. The five characters of “Nunsense” are Sister Mary Hubert (Tamara Anderson), Sister Robert Anne (Kimberly Chesser), Sister Mary Leo (Krista Kurtzberg), Sister Mary Amnesia (Jeanne Tinker) and the aforementioned Sister Mary Regina (Mary Stout). All of them brought something to the production with both vocal chops and keen comedic timing. One of the show’s funniest bits came at the end of the first act when the Reverend Mother tries a mystery substance called “rush” that a sister found in one of gym’s lockers. 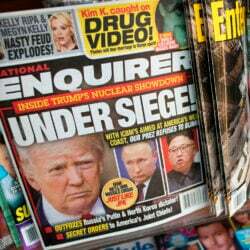 The rev goes completely off the rails, high as a kite, struggling to pronounce simple words and exclaims, “We’ll just get back and watch a couple of butch nuns dance!” through fits of laughter – her own and the audience’s. Kimberly Chesser (Sister Robert Anne), Tamara Anderson (Sister Mary Hubert), Mary Stout (Mother Superior), Jeanne Tinker (Sister Amnesia), Krista Kurtzberg (Sister Mary Leo) in “Nunsense” MSMT and Portland Stage. Stout owned her Mother Superior role for the entire show. She’s a Broadway veteran with a resume that includes roles in “Jane Eyre” and “Beauty and the Beast.” Stout’s frenzied foray was soon followed by the Act I-ending “Tackle That Temptation with a Time-Step” led by Sister Mary Hubert. The sisters tap-danced their way through the lively number, dazzling with their dance moves – a nod to the skill of the show’s director and choreographer Teri Gibson. Another standout number in “Nunsense” came in the second act with “I Could’ve Gone to Nashville” sung by Tinker as Sister Mary Amnesia. It’s a tender tune that shows off Tinker’s lovely voice. 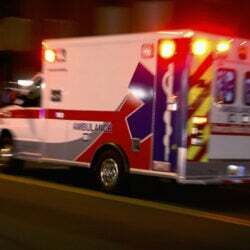 While singing it, Amnesia’s memories are triggered as she recalls her other life as a country singer before a crucifix hit her on the head, erasing her past. “Nunsense” ends with Anderson’s Sister Mary Hubert leading the rousing tune “Holier Than Thou,” which includes clever shout-outs to several saints. 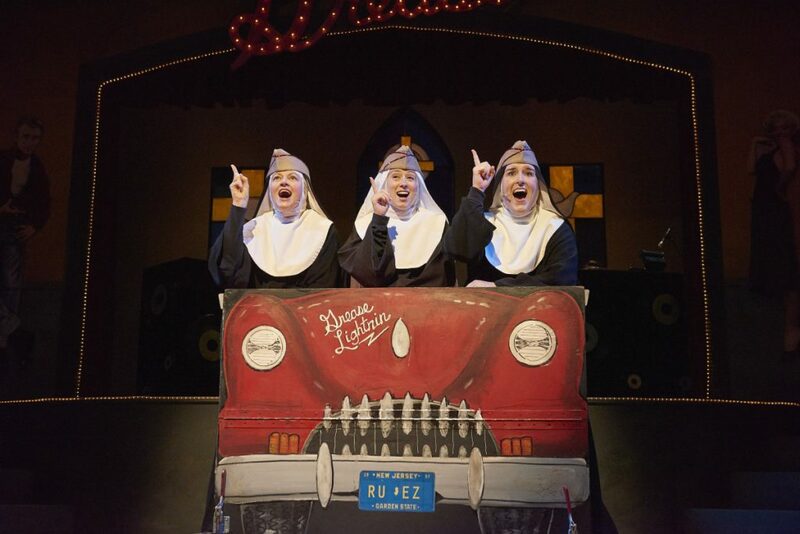 The entire audience clapped along, shouting out “Amens!” The show’s finale elicited huge, appreciative applause and with good reason: “Nunsense” is a delightful musical with tongue-in-cheek humor that pokes playful fun at the life of a nun. It made its debut in 1985 and Goggin has made a few minor updates to keep it current. The fancy TV was originally a VCR and some pop culture references were effectively freshened up.